A few weeks ago, my wife asked The Animal what kind of birthday party he wanted to have, because, you know, you can’t just have a normal birthday party anymore. I think there’s a law or something. 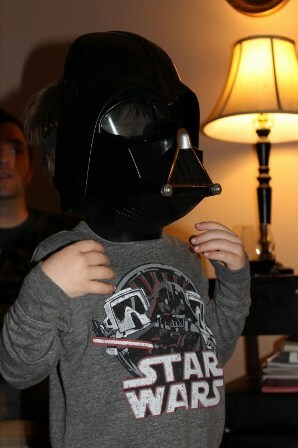 But then, just a few days later, he abruptly changed course: “I want a Darth Vader party!” Darth Vader? Where in heck did that come from? The kid had never even seen a Star Wars movie. You see, a long time ago, in a galaxy far, far away, I was sort of a Star Wars nut. It all started when I was a grossly underpaid, country radio station copywriter, in the midst of a quarter-life crisis. Right around that time, the first of the new Star Wars prequels was released, and it rekindled something inside that I hadn’t felt since I was a kid. Once again I had a reason to live! Suddenly I was spending the majority of the workday on eBay bidding for vintage toys , and it wasn’t long before my apartment was transformed into a veritable Star Wars museum. Fortunately I already had a steady girlfriend. In time I matured and grew out of my childish hobby – thank goodness – but I never fully got over the obsession. So when my son said he wanted a Darth Vader birthday, I was overcome with excitement. Since neither of my kids had ever seen the movies, I felt it my fatherly duty to educate them on this staple of popular culture. 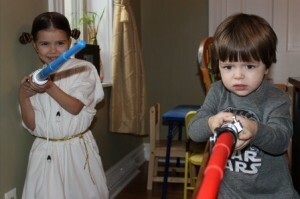 So, the week before the birthday party, I made them…er…I mean, I let them watch the original Trilogy a couple times. 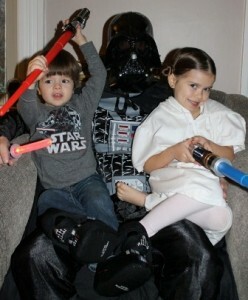 It wasn’t long before they were fully indoctrinated into George Lucas’ magical world. “Hmmm, yeeess!” I responded. “Downward dog, I will do.” Unfortunately the joke was completely lost on him. I was never so proud to be a father. On the day of his birthday, I was…I mean…The Animal was giddy with anticipation. Cass dressed up Boogs like a little Princess Leia, and I even dug out my old Darth Vader costume from the basement, soley for my son’s benefit, of course. When it was all said and done, my boy had a treasure trove of new Star Wars toys. And just think, we were that close to having a bunch of boring firetrucks to play with. For my son to play with, that is. One Response to "The Force is Strong with This One"